Plan Your Christmas Ham Gift with Ease | gThankYou! gThankYou! Ham Gift Certificates make your Christmas ham gift-giving easy and meaningful. Share your holiday gratitude with a gift that shows you care! Celebrate the gratitude and joy of the season with a traditional Christmas ham gift! Everyone appreciates the gift of food during the holidays, especially one that’s the centerpiece to their holiday celebration. It’s a meaningful gift they can share with their families and build memories around. 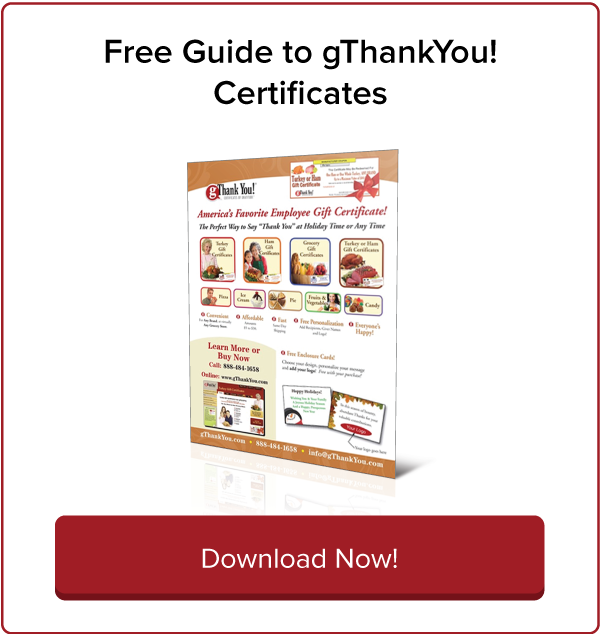 Make your Christmas ham gift program easy this year: share gThankYou! Ham Gift Certificates. 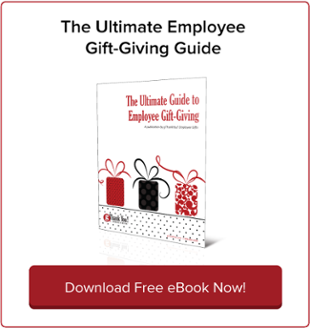 gThankYou makes it easy to plan any size of ham gift program — or for a complex distributed workforce or even at the last minute. gThankYou! Ham Gift Certificates are good for any brand of half or whole ham and for any preparation, allowing recipients to choose what’s best for their family. And our Gift Certificates can be redeemed nationally at virtually all major grocery chains stores in the U.S.
Have a large order or a distributed workforce? Call us at 888-484-1658 for volume pricing or to discuss your order requirements so we can make your Christmas ham gift-giving stress free. All our Certificates fit in standard business-sized envelopes, so they’re easy to send with company mailings or distribute in person. 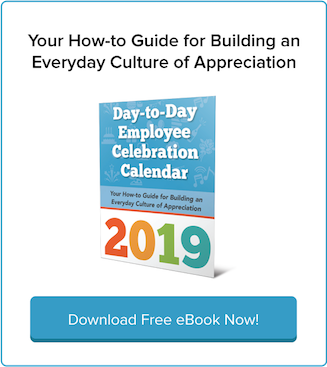 Your employees will love the extra surprise at the end of a busy year and start to the exciting holiday season. 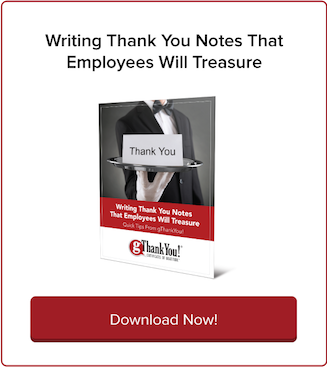 And, all gThankYou orders come with Enclosure Cards that can be personalized with your message of “Thanks” and even include your organization logo — all FREE! We have dozens of designs to choose from and for winter holiday inspiration, download our Catalog of Winter Holiday and Christmas Card Designs. We will send you a proof of your card and include it in your order for free. Read on to learn why a Christmas ham gift is so meaningful. To order your Christmas ham gifts today, call us at 888-484-1658 or online here. A Holiday Ham Gift Brings Back Memories — and Makes Memories! When you share a ham gift with your colleagues and employees, you’re giving more than ham. You’re sharing a symbol of the gratitude and joy people associate with the holiday season. In her essay “Traditions: My Father’s Ham,” Alexandra Stryon reminisces on what a Christmas ham meant to her father — and how he passed on the tradition to her. Holidays were not exactly my father’s favorite time. He hated the chaos, and dreaded the parties my mother planned, with their guest lists that grew like kudzu. Eventually, though, his hospitable spirit emerged. He brought in firewood, prepared the wines, mellowed and grew merry. But really, nothing got him quite into the groove like his preparation of a Virginia ham. The brown sugar glaze was concocted with loving intensity. He checked and rechecked the oven, brought a craftsman-like approach to cutting the meat. If you passed through the kitchen and were open to an apprenticeship, you could expect to give up a chunk of your day to a garrulous tutorial on the direction of the grain, and how exactly to lay the slices on the platter. Now, Stryon shares a ham with her family, carrying on the tradition. When you show your employee appreciation at the holidays with a ham gift, these are the kinds of memories you’re evoking and helping build! 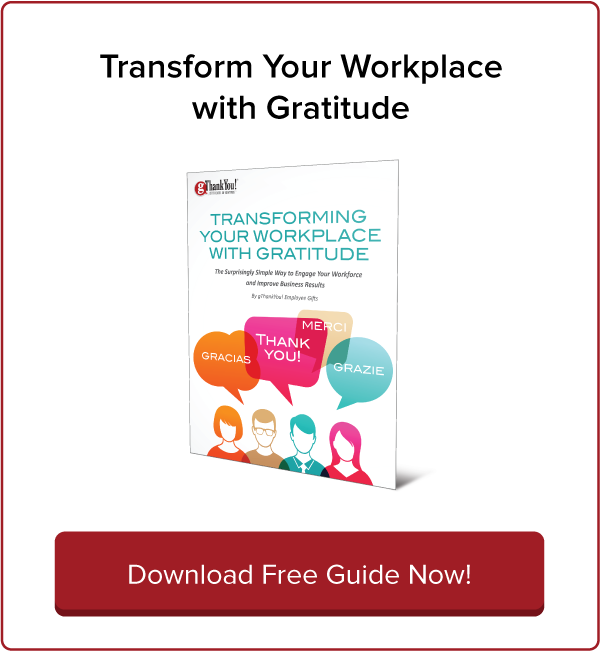 Most importantly, you’re letting your employees know that you value them not just as employees, but as people first. Bonus Gift: Share Our Holiday Ham Cookbook! Don’t just give employees the perfect holiday ham — help them learn how to prepare it to delight family and friends! Share this link with gift recipients for a FREE downloadable ham cookbook from gThankYou — our Holiday Ham Guide. It’s got all the inside tips to make your holiday ham as delicious as possible. What’s the difference between a city ham and a country ham? What are the pros and cons of bone-in vs. boneless ham? How do I bake (or boil, smoke, grill or deep-fry) the perfect ham? Looking for More Than a Holiday Ham Gift? Add choice with our popular Turkey Or Ham Gift Certificates! You can even provide an entire holiday meal with gThankYou! Certificates — see our entire selection of Certificate choices here. Turkey Or Ham Gifts for Christmas — Order Today!